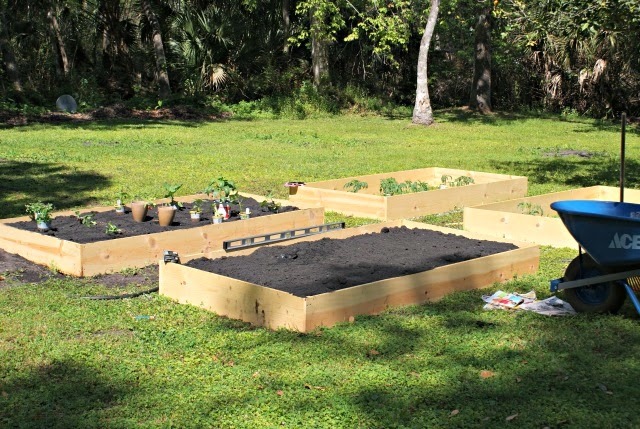 Building your own raised bed vegetable garden is easier than you think and the project can be completed in one weekend! My husband and I built ours and I'm happy to show you our process. If we can do it, you can, too! Think about what you want to grow and how much space you will need. Spend some time researching what grows well in your area and how many plants you will need to get the yield you desire. This will determine how many beds you'll need to build. We have a pretty big yard and I was in the 'go big or go home' mindset, so we opted for four 4 ft. by 8 ft. beds. I wanted to grow a large variety of herbs and vegetables and needed plenty of space. Next, you should figure out where you're going to put your bed(s). Look for a location that gets at least 6 hours of sun a day to fuel your veggies. I used a can of spray paint to map out where I wanted to place the beds, making sure that the walkways were wide enough to push a wheel barrow through. My walkways are 3 ft. wide. 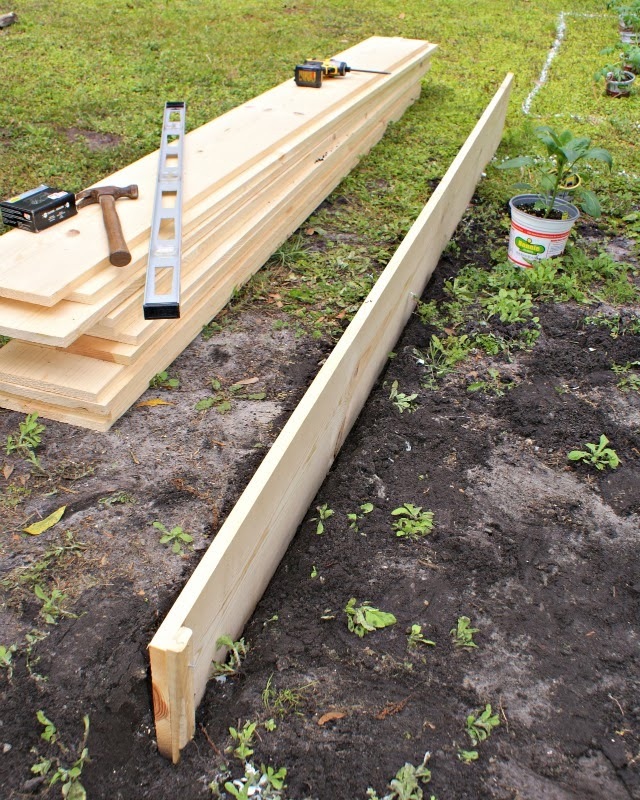 Our property is fairly un-level, so instead of constructing the entire frame and then staking it into the ground, we did one side at a time, digging small trenches when necessary to ensure that each board was level. Each long side used one full board and the shorter sides were made by cutting a board in half. 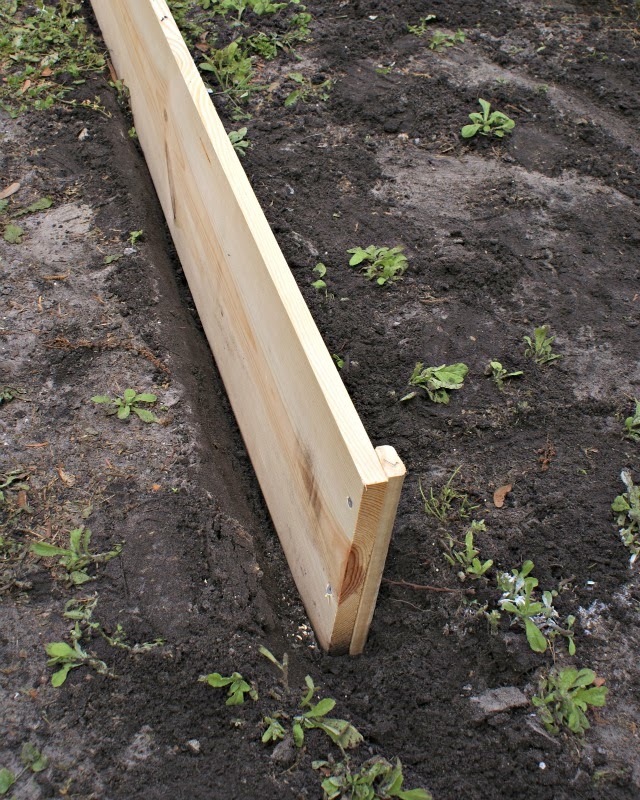 Once we achieved a level side, we pounded the stakes into the ground next to the board, drilled two pilot holes for each stake, then secured them to the board with wood screws. We used one stake for each corner and one in the middle of each long side continuing the process until the frame was complete. We lined the bottom of the bed with a layer of newspaper (about 4-5 sheets thick) to help keep the weeds out. You could also use cardboard for this step. Some people go as far as to use wire mesh in the bottom of their beds to keep other critters out, but I was all about keeping it simple. Then came the dirt! We We used a rich compost soil that we ordered from a local stone supply center. It took several wheel barrows full to fill each bed. See the dark color? Greyish black and full of nutrients for the vegetables. 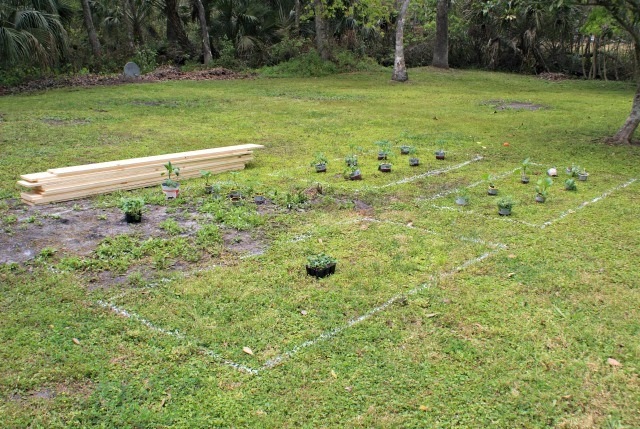 We opted to utilize the square foot gardening method to keep things organized and to make sure we had enough room for each plant to grow. This method uses a 12 in. x 12 in. grid pattern. 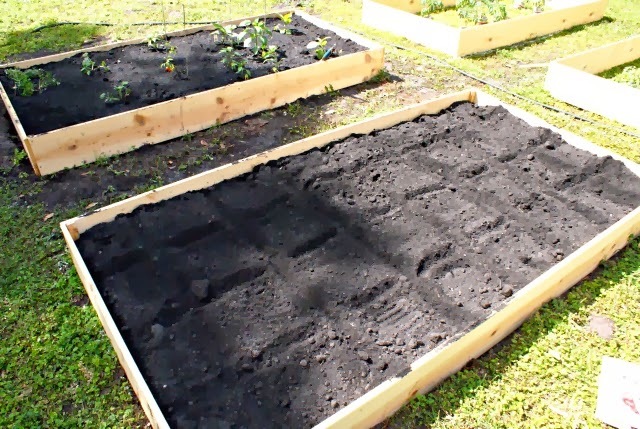 You then plant 1, 4, 9 or 16 plants per square depending on how much space the plant needs to grow. 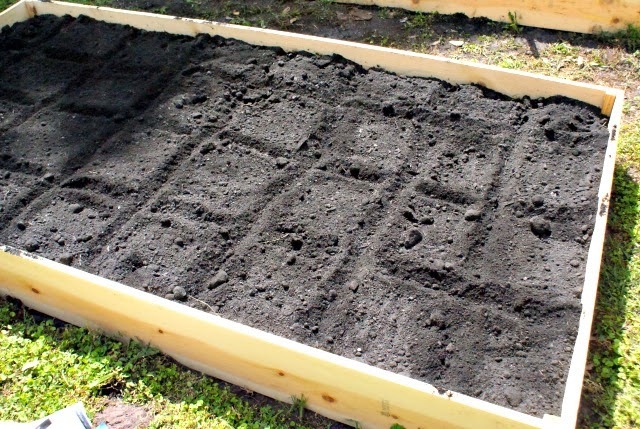 Traditional square foot gardens actually have a grid frame secured to the top of the bed, but like I said, I was keeping it simple so I merely drew a grid in the dirt as a guide. Then came the planting. 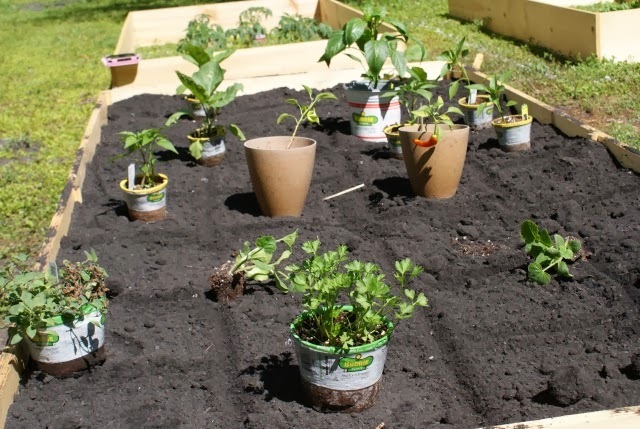 Some veggies like to be planted next to others and some don't grow well together, so make sure you take the time to research what you're growing before you put anything into the ground. Also, be sure to pick up a few companion flowers to go along with you vegetables! Some flowers can help attract pollinators and deter pests if their used in the right combinations. It will all depend on what you choose to grow, so be sure to do a little bit of planning before you hit the store. You'll have to invest in some cages, trellises and stakes once everything starts growing, but for now you can step back and admire your handiwork! Every day will bring new surprises in your vegetable garden and the feeling of pride you get from being self-sufficient is incomparable! Hi there! Thanks so much for your kind words. :) I still consider myself a novice gardener, too, but I have learned that if you plant it and love it, it will grow. I am also growing some herbs in containers and they are doing really well. Container gardening can be just as rewarding! I'm so glad you stopped by and I hope that you have great success when you eventually plant some raised beds. Please stop back with an update if you do! Happy gardening!